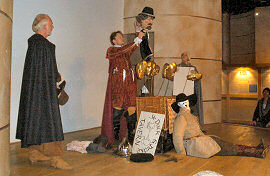 The Fifteen Minute Gunpowder Plot was commissioned by Shakespeare's Globe and the Cross River Partnership to mark the 400th Anniversary of the failed attempt to blow up King James I and all his ministers. 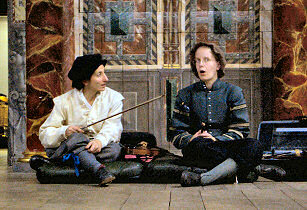 Two teams of three actors and a musician presented multiple performances on both sides of the River Thames, near the Globe and St Paul's Cathedral, followed by performances at the Globe itself. 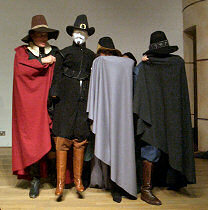 With only three actors to portray the plotters, Queen Elizabeth, King James, his ministers, priests and a host of other characters, all in fifteen minutes, the style was bold, using puppets, a stuffed guy (Guy Fawkes, naturally) a lot of hats and a very large degree of imagination. The Southbank cast was Moray Treadwell, Simon Muller, Kali Peacock and Tamsin Lewis and the Northbank cast Jon Edgley Bond, Andy Hawthorne, Dorothy Lawrence and Alison Kinder. Written and produced by Callum Coates.